One night changed them both forever. … As Zoe and Matt tussle over the best use of a billionaire’s bequest, a deeper question looms: Will one night stand in the way of their spending the rest of their days together? Six years ago, rodeo cowboy Matt Halderman he ran out on a spunky, wide-eyed student he’d just met. Now he’s found that a chance meeting with billionaire Harold Hopewell has resulted in an inheritance that will allow Matt to do something he’s long dreamed of – caring for rodeo horses at the end of their lives. Zoe Parisi hasn’t forgotten Matt or the night he walked out on her. She lost her head that night, but it’s been squarely back on her shoulders ever since. She’s a doctor now and is on track to take over an established practice in Knighton, Wyoming. She’d been sure when she decided to settle in Knighton that Matt would never return to the ranch where he grew up. But now, here he comes, waltzing back into town … looking just as good as ever and with a bunch of money. Zoe wants nothing to do with Matt or his good looks … but his money’s a whole different matter. She could use those funds to make desperately needed improvements to medical care for all the people around Knighton. Wildflowers have to be strong and resilient to bloom amid the rugged western beauty of Wyoming – and so do the women. She wrote the technical terms, but what it boiled down to was a strong allergic reaction after a massive exposure to the irritant, resulting in the patient not being able to breathe. Immediate treatment was to get away from the irritant. Ongoing treatment meant avoidance of the source and a good dose of medicine. Sort of the same way with her. She’d once had an attack of not being able to breathe — or think — when exposed to a potent dose of Matt Halderman. Distance and medicine had set her right. All she had to do now was stay away from the irritant. Taylor and her dog greeted Zoe at the door to the old house on Pegasus Ranch. Very old house. Somehow it looked worse at night. Perhaps because the scenery didn’t distract from its worn and peeling exterior. “What’s his temperature?” She patted the collie’s head. Zoe nodded. Short of a thermometer, a mom was the best fever-testing tool around. “I’d guess it’s not real high,” Taylor added. “But it’s a definite change from when I arrived. As time went on, he was more and more crotchety. This past hour, it’s been steadily downhill. Matt was stretched on a couch that appeared new and cheap. His cheeks were slightly flushed — so his blood was getting enough oxygen. He’d changed into a t-shirt and old jeans that were loose and faded nearly white. His hair was mussed, his mouth grim. He looked so damned good. Rainie was right. Matt’s face wasn’t symmetrical. And it wasn’t just his nose. The left side was a bit shorter than the right side. Was it like palm reading, where the left side was supposed to be what you were born with while the right side was what you were making of yourself? “Something between my teeth?” he growled. She’d been surveying him for medical reasons. She’d been staring for other reasons. Taylor lifted her brows slightly. Zoe nodded. Loss of appetite. Not only had the man not squandered money on a Jacuzzi, he hadn’t spent any on the inside of this house. The kitchen might have been updated in the seventies, if then. There was the lightweight couch, a round dining table with a faded-to-mush flowered tablecloth, and two dining chairs. A corner desk that seemed to slant to the right held an impressive laptop and tiny printer. The only light was an overhead fixture above the table and one of its bulbs was burned out. He grunted as he sat up, then swung his legs around. Sin trotted over and stuck his nose in Matt’s palm. Another grunt and he patted the dog. A third grunt and he stood. Zoe stayed close enough to grab him if he started to topple, but she wanted to see how he negotiated the walk. She took out a thermometer. The clinic had the quick-acting kind, but this was back to basics. She stuck it in his mouth and turned to Taylor. He mumbled something around the thermometer that an optimist could have taken as thanks. “Thank you, Taylor,” Zoe said aloud. As the door closed, she took Matt’s wrist to get his pulse. Faster than she would like. He dragged his t-shirt up. She knew human anatomy. His wasn’t all that different from anybody else’s. It wasn’t. Quickly she scanned for any abnormalities. Concentrating. She put the stethoscope’s earpieces in, placed the chest piece on his flesh, and listened. A little fast, but steady. He dropped the shirt in place and leaned forward. She pulled the back of his t-shirt up, again looking for anything unusual. Using the stethoscope, she heeded only the sounds and what they meant. “Well, Doc?” he prodded when she’d dropped the shirt. He sounded strained. He muttered something under his breath. Still standing behind him, she had a straight view over his shoulder. He’d pulled the edge of the tablecloth over his lap. Fever and his mutter took on an entirely different meaning. 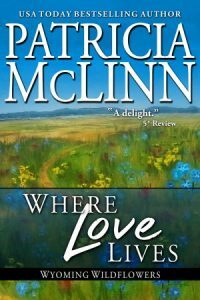 And here’s another exciting element of “Where Love Lives”: Not only is it Book 6 of Wyoming Wildflowers, it’s also part of a very special multi-author project called The Inheritance. Matt Halderman is one of several people to receive a surprising inheritance. The eccentric Harold Hopewell has left an unusual will that details bequests of all sorts, tailored to people he encountered from all walks of life. The Inheritance stories tell how these bequests affect the life – and loves – of 15 of those people. These first books will be released in 2016 – two in March, then one a month, with stories from Judith Arnold, Jean Brashear, Mary Campisi, Kathy Carmichael, Margaret Daley, Donna Fasano, Amy Gamet, Teresa Hill, Julia Kent, Trish McCallan, Lisa Mondello, Deb Salonen, Kathryn Shay and Patricia Keelyn.